The Lab Expandeth (Again!) 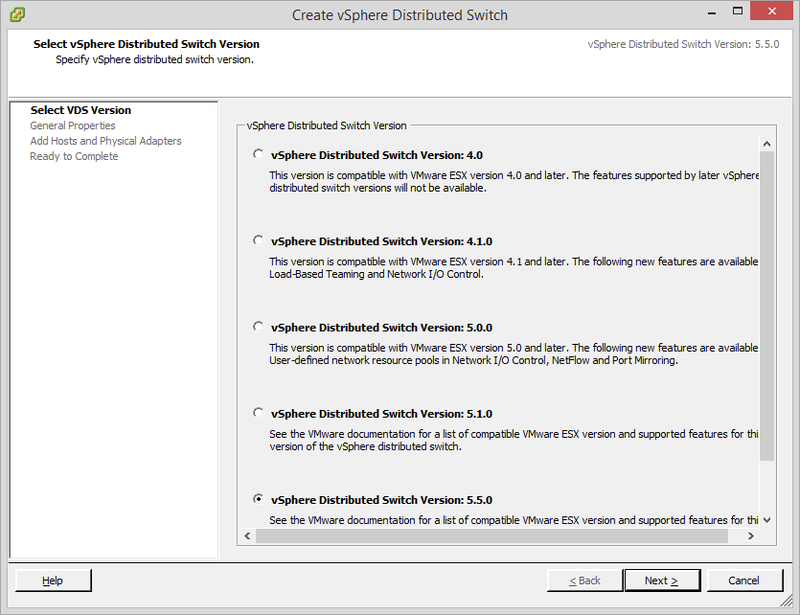 – Part IV, Nested ESX at Last! I know that there have been (literally) thousands of articles written on nested ESX, but I decided to do one anyhow as, over time, I plan to build on this foundation entry with some content that actually will be new and interesting as it relates to hybrid cloud (stay tuned for that). So with that out of the way, let’s review some basics about “nested ESX”. 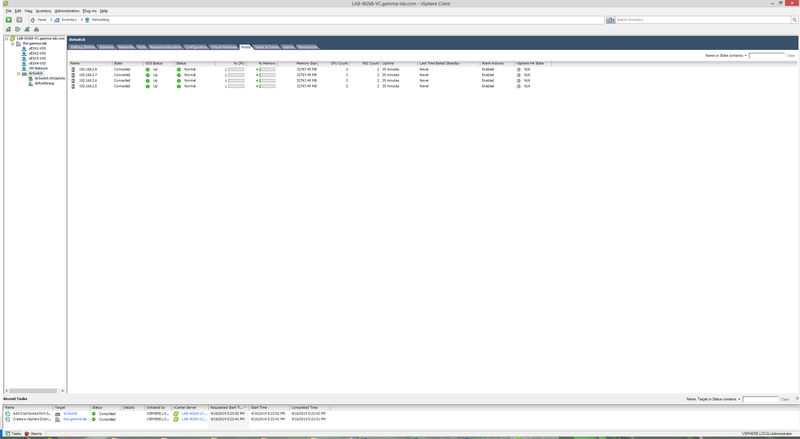 Nested ESX is exactly what it sounds like. 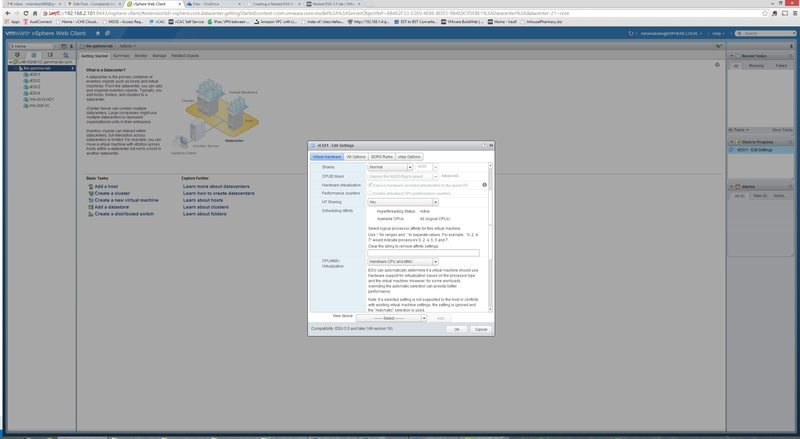 The idea is that you install ESX into a guest VM on a physical ESX host. What you end up with is hypervisor on hypervisor thereby making the CPU time slicing and overall resource allocation and consumption even more complex. So why would one do this? Well as it turns out, this is a fantastic setup for lab testing. You can basically build multiple virtual datacenters on a single machine and do nifty things like SRM testing. So certainly not something one would recommend for production, but literally miraculous for labs. With virtualization, we have a physical host, running a hypervisor OS, which abstracts physical resources into virtual resource pools and brokers their consumption by guest operating systems. 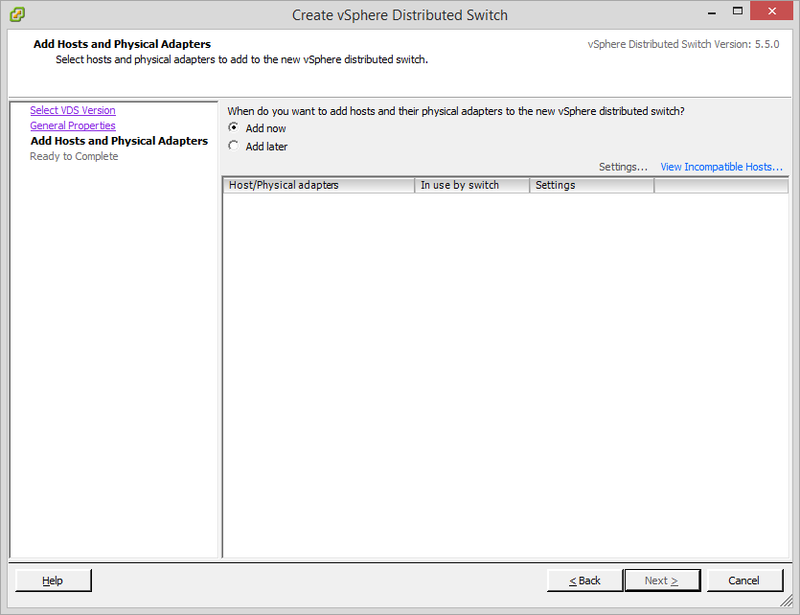 So the physical uplinks which connect the host to a physical switch are connected through software to a “virtual switch”. As virtual machines are created and deployed onto the host, they are configured with a set of virtualized hardware. This hardware is either passed through (hardware virtualization), brokered by special software support in the guest (paravirtualization), in some cases, emulated. 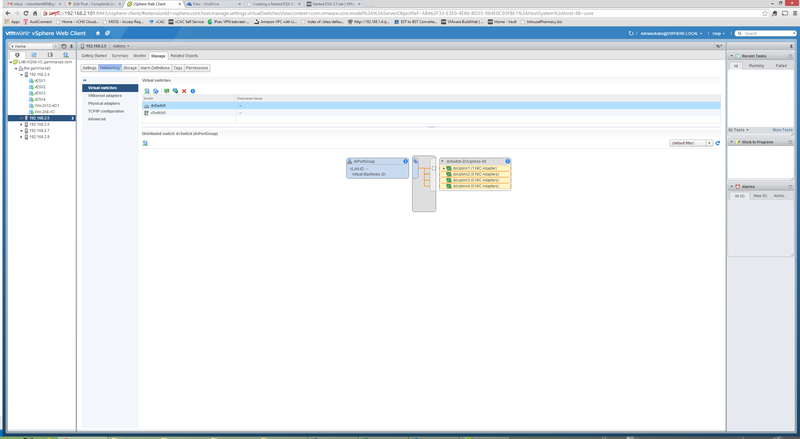 With x86 virtualization, the CPU is time sliced and instructions are passed through. So “virtual CPUs” are essentially timeshare units on the actual physical CPU. I have a more extensive article on the various flavors of x86 virtualization that provides more background on these concepts. 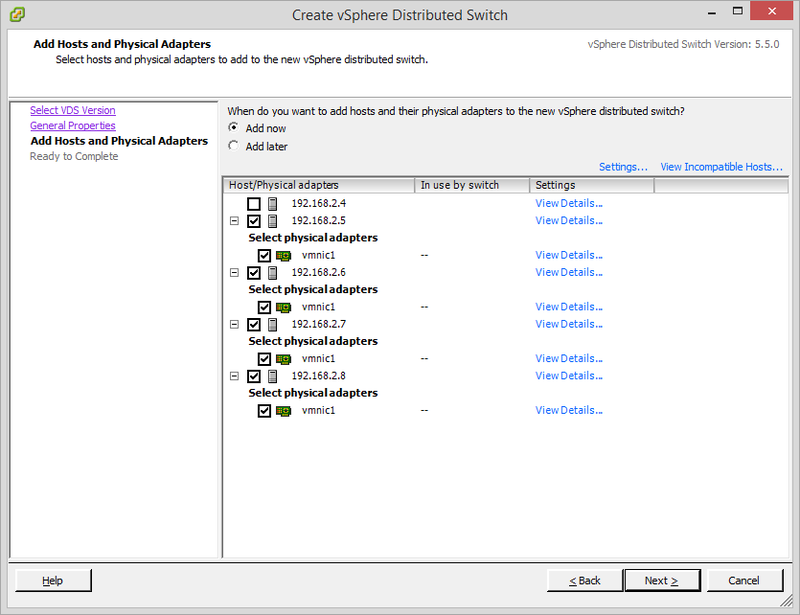 Under ESX, networking is interesting in that there are two options. Using the VMware VMXNET virtual network interface you are using a paravirtualized driver which requires installation inside the guest OS and as a result delivers optimized performance. Alternatively, the host can emulate the function of the Intel E1000 NIC and trick the guest OS into thinking one of those actually physically exists at a given PCI I/O address range. 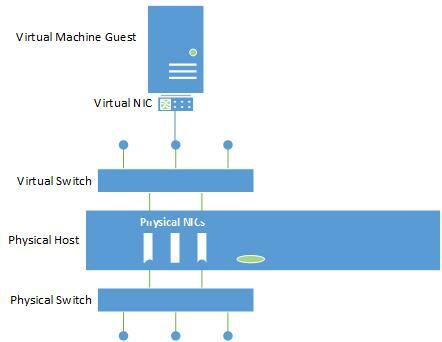 Whichever approach you choose, ultimately the virtual NIC will be connecting to the virtual switch. The diagram above captures the flow. The key point here is that the relationships are all 1:1. A guest OS has one (or more) NICs that connect to the virtual switch, but it basically replicates how the physical world would work. Now consider what happens when it is a hypervisor in the guest OS. MAC Address Change – this setting deals with the problem going the other way. This setting basically allows the guest OS to do locally administered station address control of its virtual NIC MAC address. This is us telling the virtual switch intelligence to not worry about it if the MAC address allocated to the guest VM virtual NIC happens to change. Forged Retransmit – a companion setting, forged retransmits basically says that the virtual switch shouldn’t be concerned if MAC address 00:00:00:00:00:0B suddenly shows up at the virtual port where 00:00:00:00:00:0A had originally attached. Taken as a group, these settings allow traffic to flow out from nested guests (MAC changes and forged retransmits) and the return traffic to flow in to them (promiscuous mode). So with that networking configuration done, we must be good to go right? Well not so fast! There is more that needs to be done for nested to work. The next complication comes from the configuration of the virtual machine itself. After all, we are going to be installing a hypervisor into this guest. These days, the virtual machine monitor is no longer a pure software thing. Even VMware (the grand daddy of x86 VMMs and last to move away from pure software) now utilizes CPU and chipset support for virtualization – namely Intel VT and AMD V. As a result, this support (normally obscured from the guest) needs to be exposed to it. 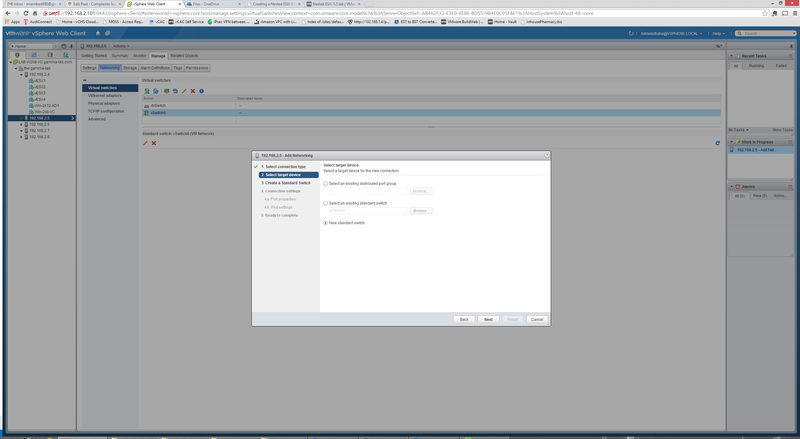 For these options we actually need the vSphere Web Client to configure them (interesting requirement that basically makes vCenter mandatory for nested implementations in one way). 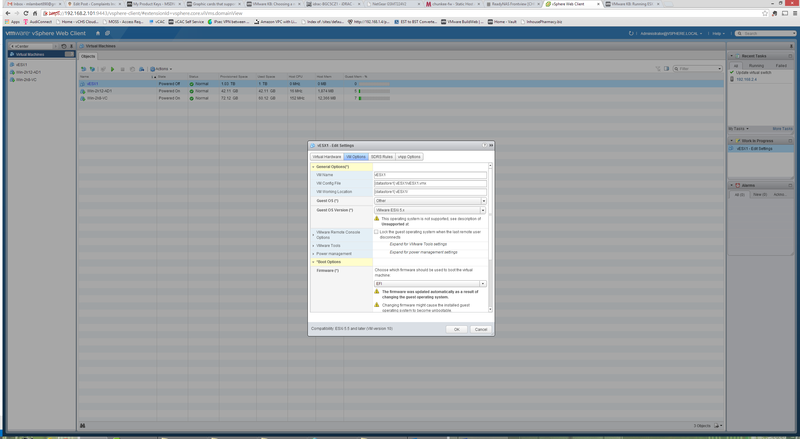 Luckily I do have a vCenter that I put up immediately after the initial ESXi 5.5 install on the physical host. 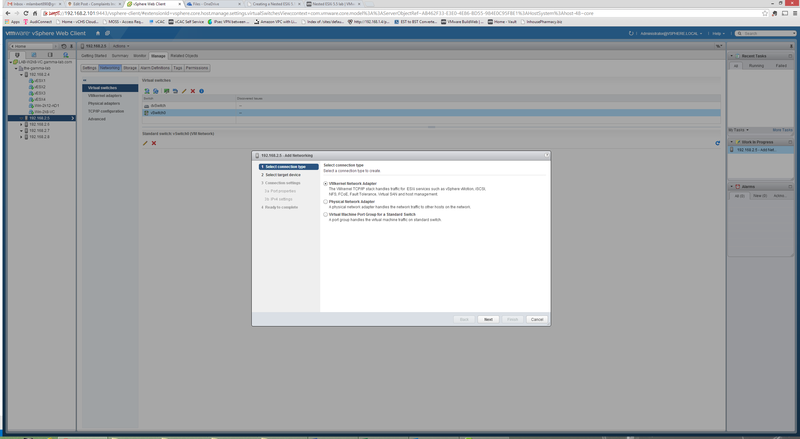 I documented the setup as a sidebar in case anyone would like to see the latest changes in both Windows and vCenter. 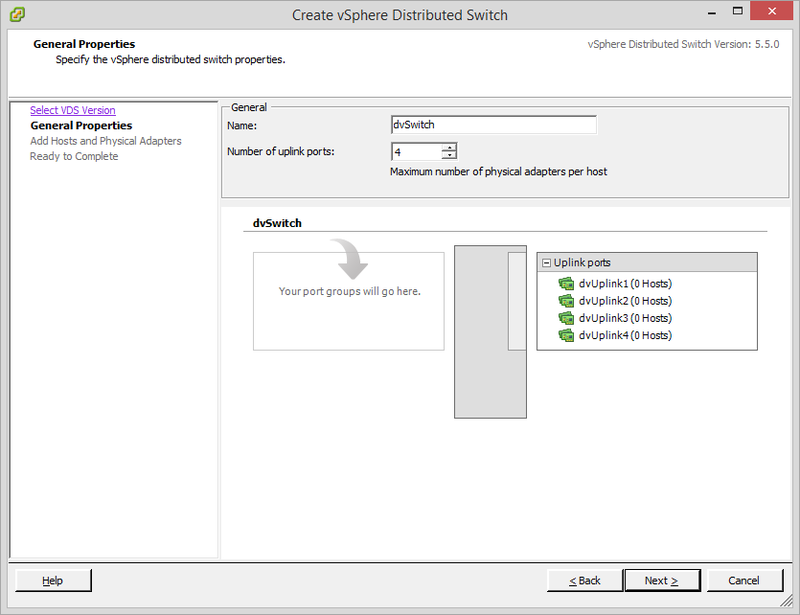 I am planning 4 virtual ESX hosts rather than 3. 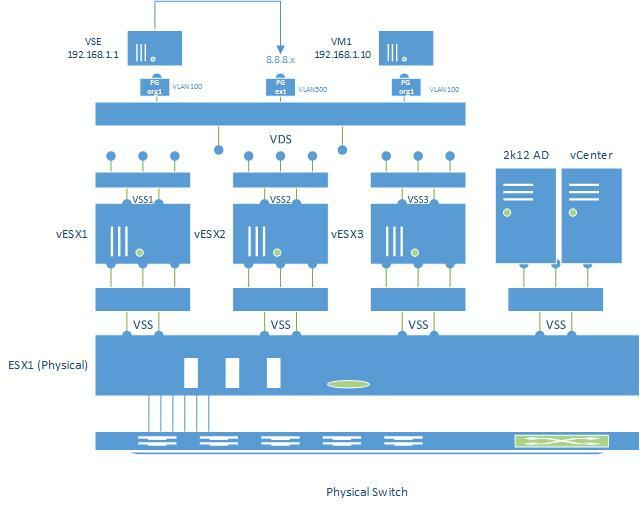 They will have 32GB of RAM, 1TB of disk, 4 vCPUs (2 virtual dual cores) and a 15GB SSD (for vSAN). 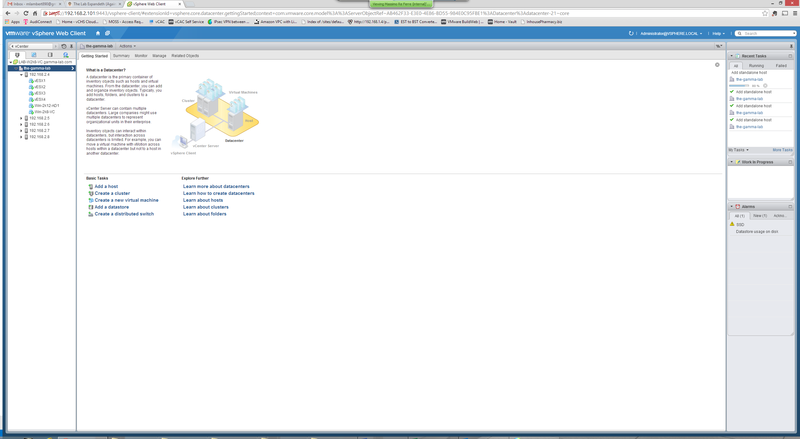 vCenter and AD will run on the physical host along with some other core bits (vCenter Mobile Access, maybe one or two other things). The main host is left with 5TB of disk, 10GB of SSD, 64GB of RAM, and 4 full time CPUs. Next step is just to commit the config and create the switch. As we can see below everything went as smooth as can be and the 4 virtual hosts are now linked by a vDS! We are now about 70% of the way towards our diagram and all of the foundation has been laid, so this is a good stopping point. Hope you enjoyed the (million and first) entry on Nested and stay tuned for the next entry!